Atal Bihari Vajpayee dies: In June 1999, Pakistan began hostilities in Kargil that took the two countries to the brink of a full-scale war. Atal Bihari Vajpayee felt betrayed and never hid his bitterness whenever Kargil was mentioned. Atal Bihari Vajpayee was a statesman and pragmatist, orator and poet, a man of peace and conviction. Atal Bihari Vajpayee was a towering nationalist who softened the often sharp edge of his party's politics with sophisticated inclusiveness, earning him the sobriquet "ajaat shatru" or the man with no enemies. Atal Bihari Vajpayee, the first prime minister from a non-Congress party to complete a full term in office, began shakily - his first stint as prime minister in 1996 lasted only 13 days when his unlikely coalition government failed to get support from other parties. The BJP-led coalition government came back to power in 1998, and this time Atal Bihari Vajpayee stayed in office for 13 months before losing a no-confidence motion by one vote. The National Democratic Alliance returned to power in October 1999 with Atal Bihari Vajpayee as prime minister once again. This time Atal Bihari Vajpayee lasted the entire term, capping a glorious career that saw him go from student activist to journalist, Rashtriya Swayamsewak Sangh pracharak, Member of Parliament, foreign minister, opposition leader and finally a much-loved leader of the nation. Like many of his generation, Atal Bihari Vajpayee - who died today at age 93 - came into politics as an 18-year-old during the Independence movement in 1942 when the Quit India movement was going on. A lifelong bachelor, Atal Bihari Vajpayee was first elected to Lok Sabha in 1957 from Balrampur in Uttar Pradesh in India's second general elections. His maiden speech in Parliament so impressed his peers and colleagues that the then Prime Minister Jawaharlal Nehru introduced Vajpayee to a visiting foreign dignitary thus: "This young man one day will become the country's prime minister." Atal Bihari Vajpayee remained a member of Parliament for 47 years - elected 10 times to the Lok Sabha and twice to Rajya Sabha. Atal Bihari Vajpayee's signature in politics was achieving pragmatic consensus, and in this process he earned the respect of his party, allies and opponents. Abroad, Atal Bihari Vajpayee projected a harmonious image of India and connected it to the world through his foreign policy outreach. Fluent in English, Atal Bihari Vajpayee oratory was at its best in Hindi. With his well-timed wit, and carefully-chosen words delivered with trademark long pauses, Atal Bihari Vajpayee's oratory was at its best in Hindi. Atal Bihari Vajpayee immediately connected with all those who came in contact with him -- the common man, politicians, bureaucrats, students and world leaders. As foreign minister under the Janata Party government headed by Morarji Desai in 1977, Atal Bihari Vajpayee was the first leader to deliver a speech to the United Nations General Assembly in Hindi. Atal Bihari Vajpayee was awarded India's highest civilian award, the Bharat Ratna, in March 2015. While Atal Bihari Vajpayee's six years in office were defined by several crises - including the hijacking of an Indian Airlines jetliner to Kandahar, Afghanistan in 1999, an attack on the Parliament building in 2001, communal riots in Gujarat in 2002 - Atal Bihari Vajpayee also left a mark with peace initiatives and infrastructural projects. Chief among them is the Golden Quadrilateral Highway network, connecting India's four major metropolises with 5,846 kilometers of roads. During his second term as prime minister, Atal Bihari Vajpayee ordered nuclear tests in May 1998 in a strategic masterstroke to blunt Pakistan's nuclear ambitions while at the same time announcing a moratorium on future testing. Atal Bihari Vajpayee followed this up with peace overtures to Pakistan, riding on the first direct bus from India to Pakistan in February 1999. Undeterred by party hawks, Atal Bihari Vajpayee arrived in Lahore on the bus, accompanied among others by legendary actor Dev Anand. Atal Bihari Vajpayee met with then Prime Minister Nawaz Sharif in what was hailed as the dawn of a new era in India-Pakistan relations. 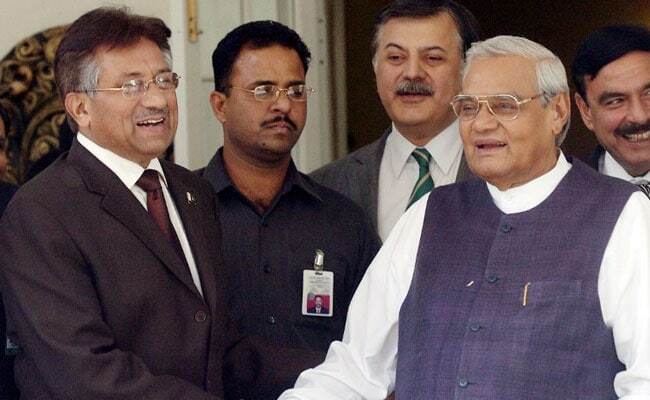 However, then army chief General Pervez Musharraf did not turn up to greet Atal Bihari Vajpayee at the Wagah border. It soon became clear why. Only months later, in June 1999, Pakistan began hostilities in Kargil that took the two countries to the brink of a full-scale war. Atal Bihari Vajpayee felt betrayed and never hid his bitterness whenever Kargil was mentioned. He tried again to build peace with Pakistan -- which people close to him say was the mission of his life -- by holding a historic summit in Agra with Musharraf in 2001, who by then had become the president. But the summit too failed spectacularly. Unwilling to hide his feelings over the riots, Prime Minister Atal Bihari Vajpayee said the government must follow "raj dharma". In his autobiography, former President Pranab Mukherjee wrote that the Gujarat riots were "possibly the biggest blot" on Atal Bihari Vajpayee's government that could have cost the Bharatiya Janata Party the 2004 Lok Sabha elections. After the NDA was routed in the elections, Atal Bihari Vajpayee announced his retirement from politics in 2005 and slipped into relative political oblivion. He was rarely seen in public after suffering a stroke in 2009, and subsequently developed dementia. However, Atal Bihari Vajpayee's influence loomed large over the party, which often quoted him and his policies. In his Independence Day speech yesterday, PM Modi said he wants to resolve the Kashmir issue through Atal Bihari Vajpayee's doctrine of "Insaniyat, Kashmiriyat, Jamhooriyat", which seeks to preserve the composite Kashmiri culture while ensuring democracy in a humane manner. When he assumed office for the second time in 1999 as the head of a more stable coalition, Atal Bihari Vajpayee had to abandon some of the cornerstones of BJP's policies to get the backing of more secular groups. This included the BJP's demands for scrapping the special status for Jammu and Kashmir, building a Hindu temple on the site of the Babri mosque in Ayodhya and abolishing the separate civil code for Muslims. The demolition of Babri Masjid by kar sewaks in December 1992, when he was the Leader of Opposition in Lok Sabha, was an acid test for Atal Bihari Vajpayee's secular agenda and his stand within the party. Atal Bihari Vajpayee's trusted lieutenant LK Advani and most BJP politicians supported the demolition but Atal Bihari Vajpayee condemned the attack unequivocally. At times he tried to appeal to Muslims and other minority groups, and was seen as a reassuring figure for India's mainly secular establishment. A romantic at heart, Atal Bihari Vajpayee wrote poetry in his spare time, and was a connoisseur of good food. Atal Bihari Vajpayee was born on December 25, 1924 in Gwalior, Madhya Pradesh to a schoolteacher, Krishna Bihari Vajpayee, and Krishna Devi. Today, Atal Bihari Vajpayee's birthday is celebrated as 'Good Governance Day'. After schooling, Atal Bihari Vajpayee graduated from Victoria College in Gwalior, now known as Laxmi Bai College. Atal Bihari Vajpayee did his M.A. in political science from DAV College in Kanpur. Following a brief flirtation with communism, Atal Bihari Vajpayee became a full-time worker of RSS in 1947. Atal Bihari Vajpayee subsequently entered journalism and was editor of Rashtradharma, a Hindi monthly, the Panchjanya Hindi weekly and the dailies, Swadesh and Veer Arjun. Atal Bihari Vajpayee became a close follower of Syama Prasad Mookerjee, the founder of the Bharatiya Jana Sangh, the precursor to Jana Sangh and later the BJP. Under Mookerjee's tutelage, Atal Bihari Vajpayee's right-wing philosophy shaped. Atal Bihari Vajpayee accompanied Mookerjee to Kashmir in early 1950s during the BJS leader's fast-unto-death to protest the identity card requirement for Indian citizens visiting the state. It was Atal Bihari Vajpayee's first insight into the Kashmir problem, which decades later he addressed in 2003 with the "Insaniyat, Kashmiriyat, Jamhooriyat" doctrine. Atal Bihari Vajpayee is survived by his adopted daughter, Namita Kaul Bhattacharya.